There’s something about starting the day with a steaming bowl of porridge that just feels right at this time of year. It’s warming, nutritious, and energizing, and I find it fills me up and keeps me going all way until lunchtime, unlike some other breakfasts where I already need a snack by the time 10 am rolls around! Porridge can be made with pretty much any grain: there’s cream of wheat, cream of rice, quinoa porridge, and of course, the more familiar oatmeal, to name a few. But one chilly morning last fall, while I was staying with my friend Val of Open Kitchen blog, she made me a bowl of porridge made from teff grain and it was a revelation. I instantly fell in love with this small but mighty grain. And these days, teff porridge is my all-time favorite way to start the day. 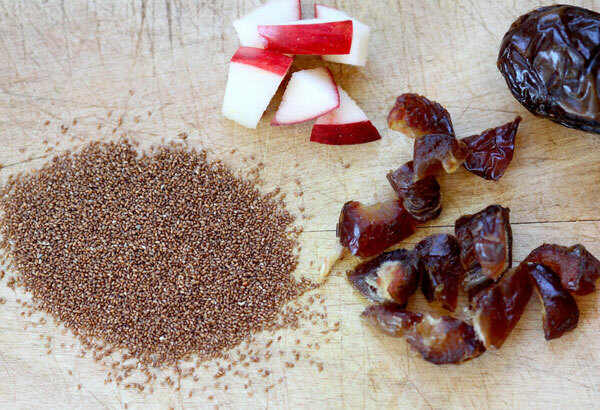 You may not have heard of teff before. But if you’ve ever had Ethiopian food, chances are you have eaten it because that’s what those large bubbly injera crepes are made of. 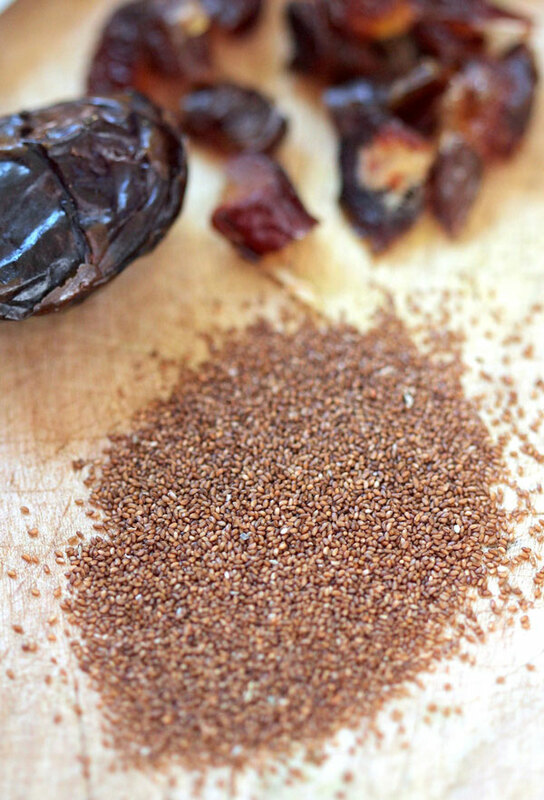 Teff has been grown in Ethiopia for thousands of years and its claim to fame is that it holds the title of smallest grain in the world! 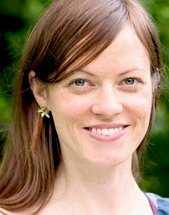 It actually takes 100 grains of teff to make one kernel of wheat. But what it lacks in size, it makes up for in nutrients. It’s packed with calcium, iron, and fiber. It’s also gluten-free and high and protein so it’s a great option for vegetarians and folks who are gluten-intolerant. But personally, I just like it because it makes the most deliciously nutty, creamy, and flavorful breakfast porridge. I generally follow the porridge recipe found on the back of the Bob’s Red Mill teff packages, adding whichever nuts and fruit I have on hand. 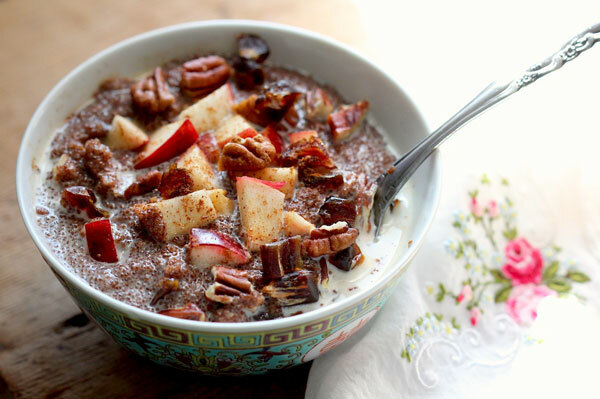 This hearty apple date pecan teff porridge is my latest variation on that recipe. It’s delicious and filling. You can find teff in most health food stores. I hope you’ll give it a try, you won’t regret it! 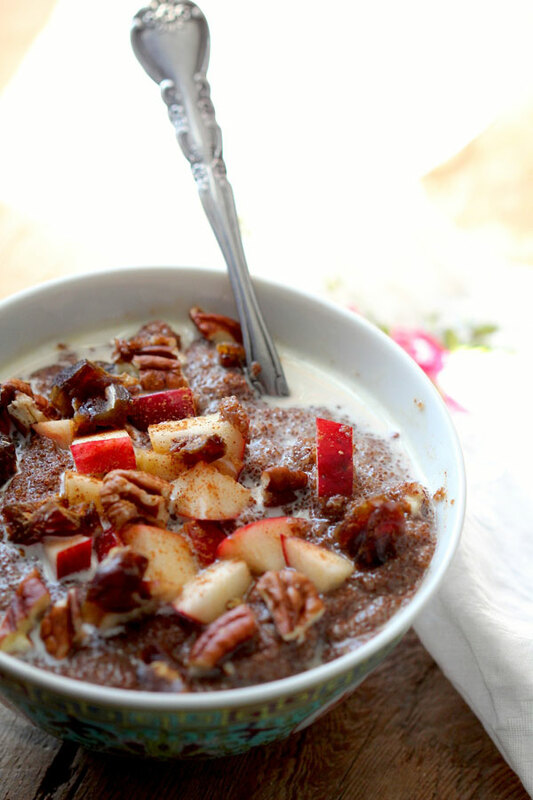 Start your day with a bowl of teff porridge for a nutritious meal with apples, dates, and pecans from food blogger Aube Giroux of the Kitchen Vignettes blog. Place a small heavy saucepan on medium-low heat, and add the teff. Toast it, stirring frequently to make sure it doesn't burn. After about 5 to 10 minutes, the grains will make little crackling sounds as they start to pop. Add the water, butter, cinnamon, half of the dates and stir well. Bring to a gentle boil, cover, and cook for about 15 to 20 minutes. If the porridge becomes too thick, you can add a little water. Once the porridge is thickened to your liking and the grains are soft (about 15 to 20 minutes), remove from heat. Stir in the cream or milk, ladle into bowls and top with chopped apple, pecans, and remaining chopped dates. Sweeten with honey or maple syrup if you wish, though the dates already lend a sweetness. Dust with a little cinnamon and serve.